This year’s artist vendors include Weehah Greeting Cards by Louisa Wimberger, pottery by Cher Willems, marbled silk scarves and gifts by George Reynolds, colorful figurines from Sally White, jewelry by Laurie Wojtusik, 3D art quilts by Dawn Allen, button bracelets by Deena Sarvet, and subway-style map prints from graphic design firm Transit Authority Figures. ArteSana will be selling accent pillows made by women in Holyoke. The organization collects donations of discarded tee shirts, strips them, and uses looms to weave them into products, which generates income for the weavers and helps fund free creative workshops and free English for Speakers of Other Languages classes made available to their community. Prosperity Candle operates out of Easthampton’s Eastworks. Every hand-poured candle creates opportunities for women refugees building a brighter future in the U.S., and supports women’s entrepreneurship around the world. They will also be selling Pioneer Valley Gift Baskets, which feature small-batch products from area producers. Amherst-based Esperanza Soaps makes all-natural, handmade soaps and scrubs at its factory in Las Malvinas II, a slum in the heart of Santo Domingo, Dominican Republic. Their factory location was specifically chosen to bring good jobs to women that want a brighter future for themselves and their children. 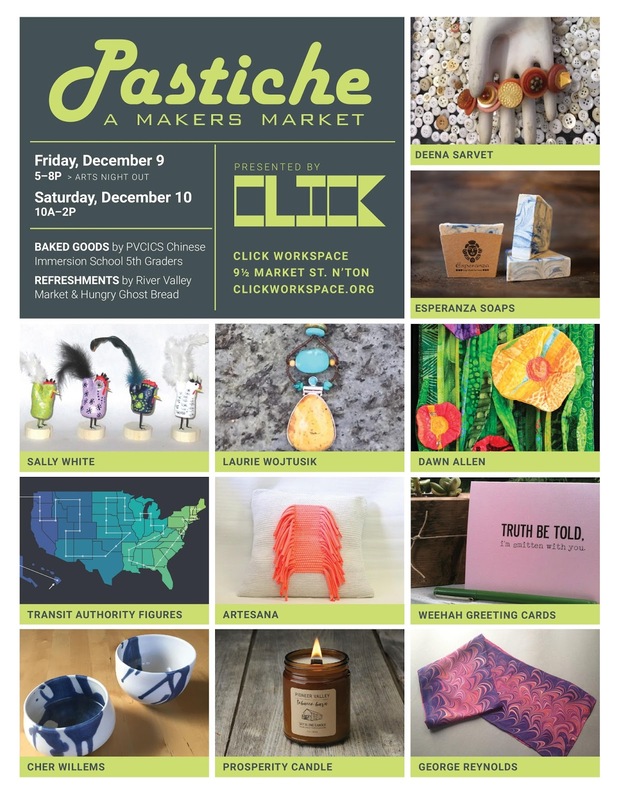 Click Workspace invites everyone – from holiday shoppers to curious passers-by – to stop into Pastiche, meet these local artists, enjoy refreshments from Hungry Ghost Bread and River Valley Market, and find gifts to feel great about giving this season. 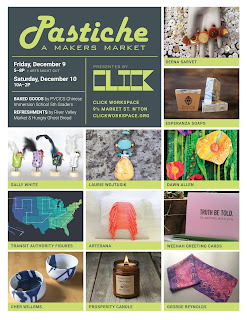 More information is available at http://clickworkspace.org/events/pastiche.